SCORED BY SIDNEY CROSBY on march 31, 2017 at new york. the goal was crosby's 43rd of the 2016-17 season and 381st of his career. Sidney Crosby won the Maurice Richard Trophy as the National Hockey League's leading goal-scorer in 2016-17 with 44 goals. He added 45 assists for 89 points in 75 games to finish second in the league scoring race behind Connor McDavid's 100 points in 82 games. In the 2017 Stanley Cup Playoffs, Crosby racked up 27 points including a league-leading 19 assists. He had eight multi-point games including two in the Stanley Cup Final en route to winning his second consecutive Conn Smythe Trophy as the player judged to be most valuable to his team during the Stanley Cup Playoffs. 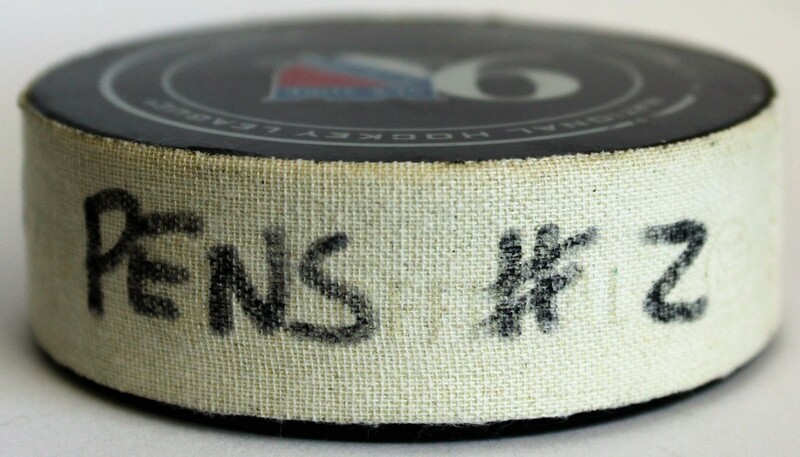 On March 31, 2017, the Penguins faced the New York Rangers at Madison Square Garden in New York City. With the Penguins leading 1-0 just past the midway point the second period, Ron Hainsey fired a wrist shot from the point that went wide of the Rangers goal. Conor Sheary backhanded the puck behind the goal to Crosby who backed away from the goal below the end line while being challenged down low by Rangers defenseman Dan Girardi. 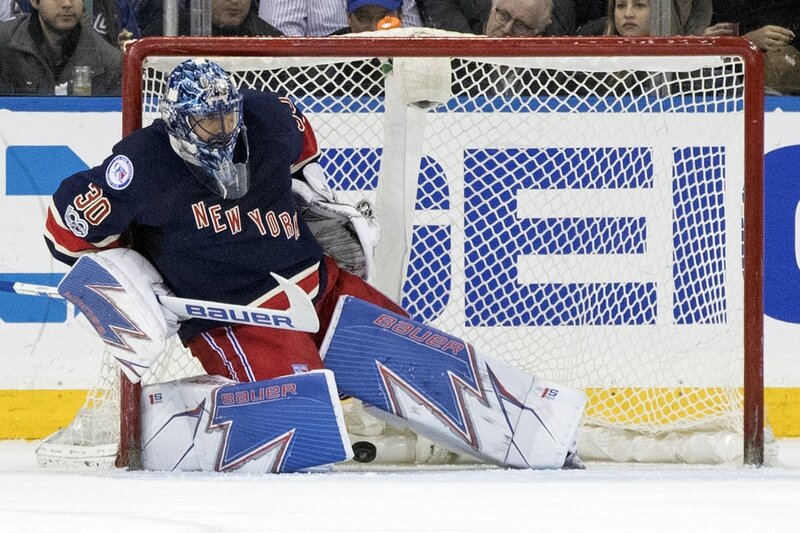 Crosby fired a shot at the mask of unsuspecting Rangers goalie Henrik Lundqvist. 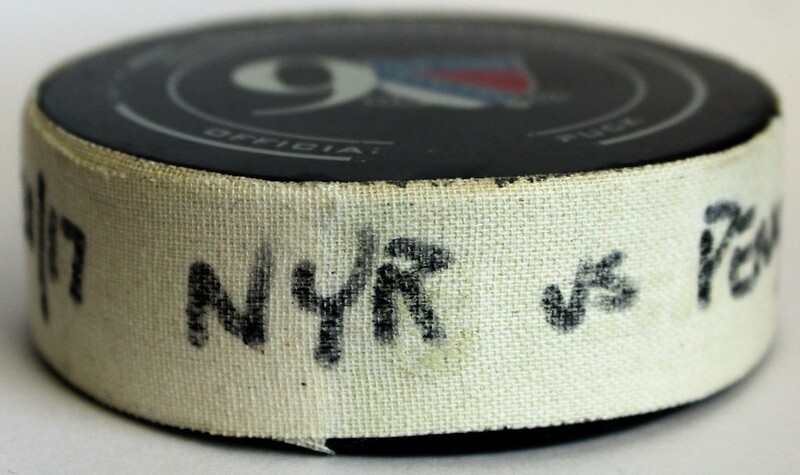 The puck deflected off of Lundqvist's mask and into the net. The goal gave the Penguins a 2-0 lead and is an iconic moment from Crosby's wizardry with a puck throughout his NHL career. 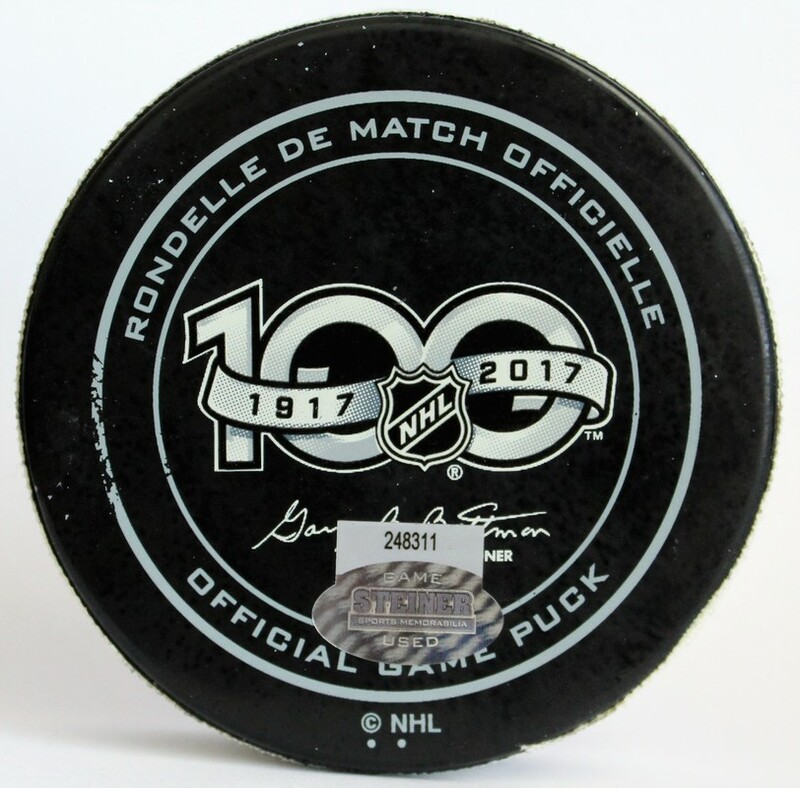 This puck was scored by Sidney Crosby at 10:46 of the second period of the March 31, 2017 game as the Pittsburgh Penguins faced the New York Rangers at Madison Square Garden. The goal was Crosby's 43rd of the 2016-17 season and 381st of his career. The even-strength goal was assisted by Conor Sheary and Ron Hainsey. 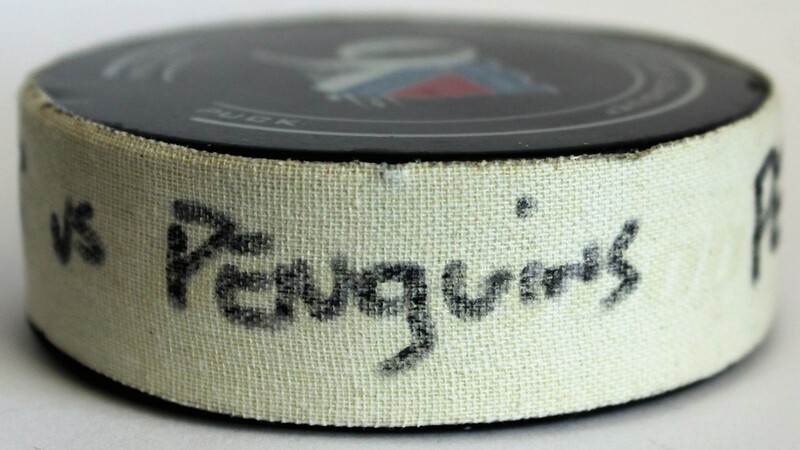 The Penguins won the game 4-3 in a shootout with Crosby scoring the shootout-clinching goal past Henrik Lundqvist. 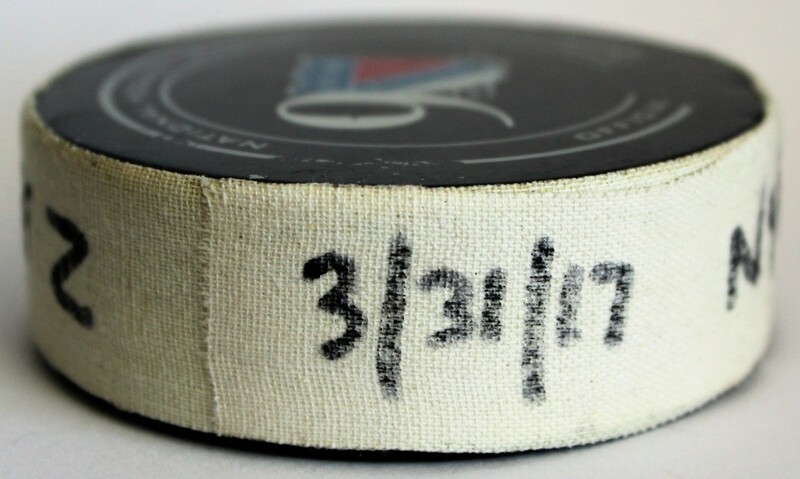 The puck was acquired by PenguinsChronicles.com ​​from Steiner Sports on April 17, 2017. 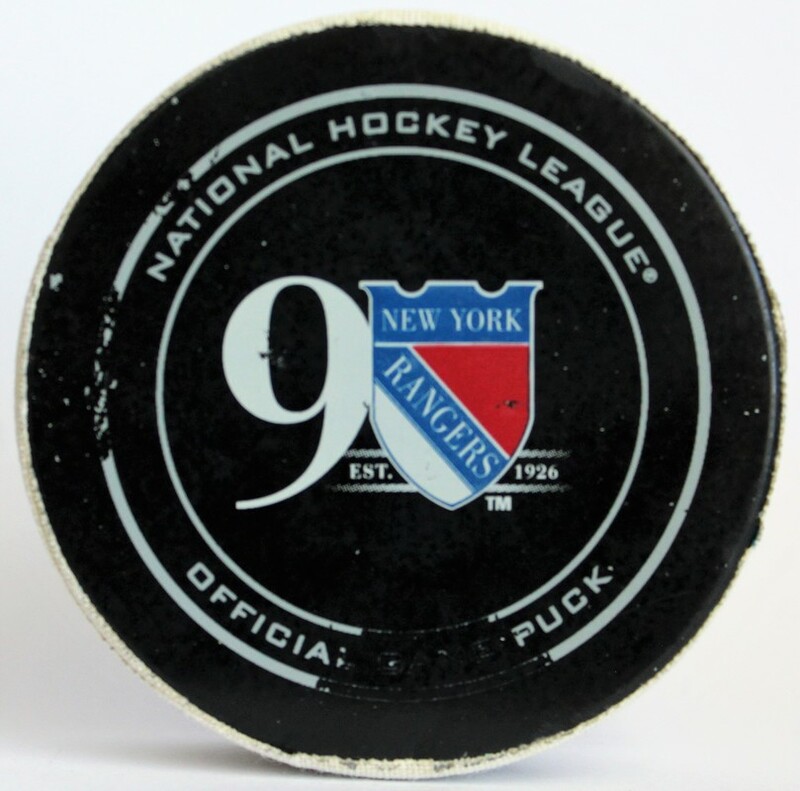 The puck was part of the Steiner Sports Team Partnership program with the New York Rangers. 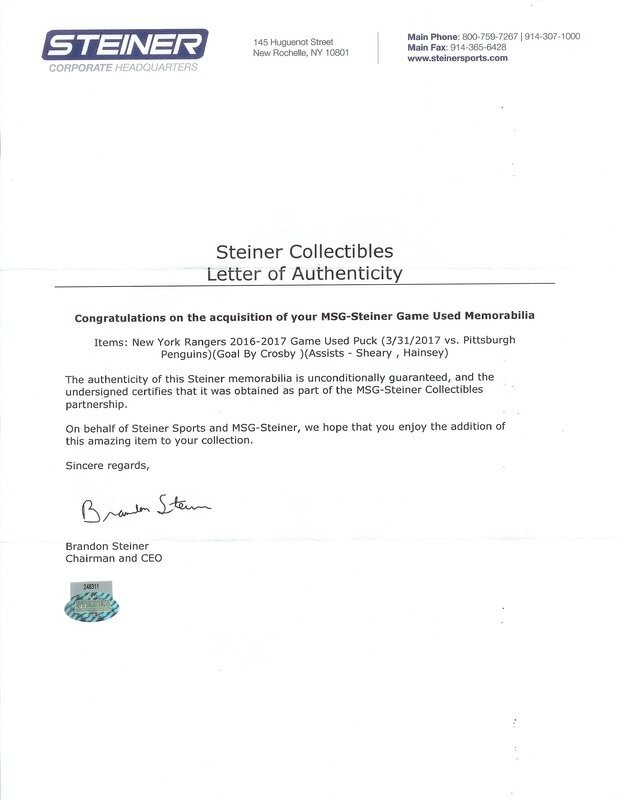 A New York Rangers / Steiner Sports certificate of authenticity was included with the puck.